SYSTEM OF A DOWN guitarist Daron Malakian has confirmed to Revolver that the band has been stalled in its attempts to record a follow-up to its "Mezmerize" and "Hypnotize" albums, which came out in 2005. He explained:"I couldn't say ever, but as of right now, it's not looking like we're doing something together soon. I can't close the book on it and say it's done forever. We still play live. We're all still friends. All my bandmembers posted 'Lives' [from Malakian's SCARS ON BROADWAY project] on their own Facebooks and Instagrams, so we're all very supportive of each other. It's more a combination of where each person is at a different point in their life, and each person wants to do a different thing. There are some creative differences as well on what direction each one of us wants to take the next SYSTEM album, if that ever happens. Which is fine. I'm not sitting here upset or anything. The only thing I'm a little frustrated with was waiting for that to maybe happen or not happen. Too much time has passed by since I've released anything with SCARS or SYSTEM. But it's never too late. Daron's latest comments echo those made by SYSTEM OF A DOWN frontman Serj Tankian, who told Rolling Stone: "We've discussed [the possibility of making new music] and we've played each other songs, but we still haven't come eye to eye on how things should be done for us to be able to move forward with it. And that's where it’s been." Tankian added that ironically the band members are getting along better than ever, saying: "That's the funny thing. When people don't see a record, they assume the worst about your internal relationship. But the truth is we're actually better friends — at least I'm better friends with everyone than I've ever been." Tankian continued: "We have a great time together touring. But sometimes putting together a record, and that creative output and how things should be done, is different in four people’s heads and it doesn't always come together." 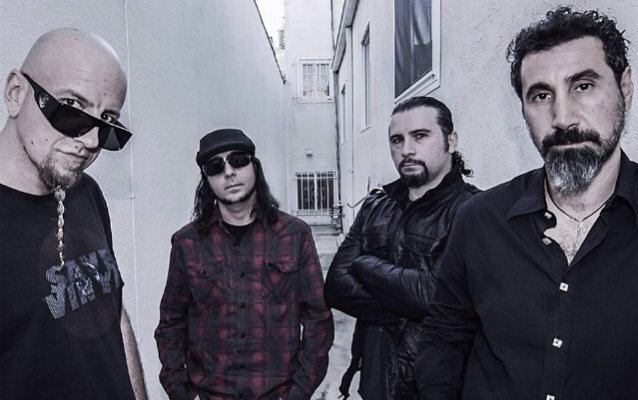 Tankian and Malakian have toured with SYSTEM OF A DOWN over the past few years but the band has not released new music in more than a decade. Drummer John Dolmayan revealed in a 2016 interview that the group had written music for more than a dozen new songs, but those remain in limbo. Malakian's long-dormant side project, SCARS ON BROADWAY, will release its new album on July 20. The band itself, now rebranded DARON MALAKIAN AND SCARS ON BROADWAY, has undergone a complete overhaul, with none of the members from the group's 2008 debut — including Dolmayan — appearing on the new songs.